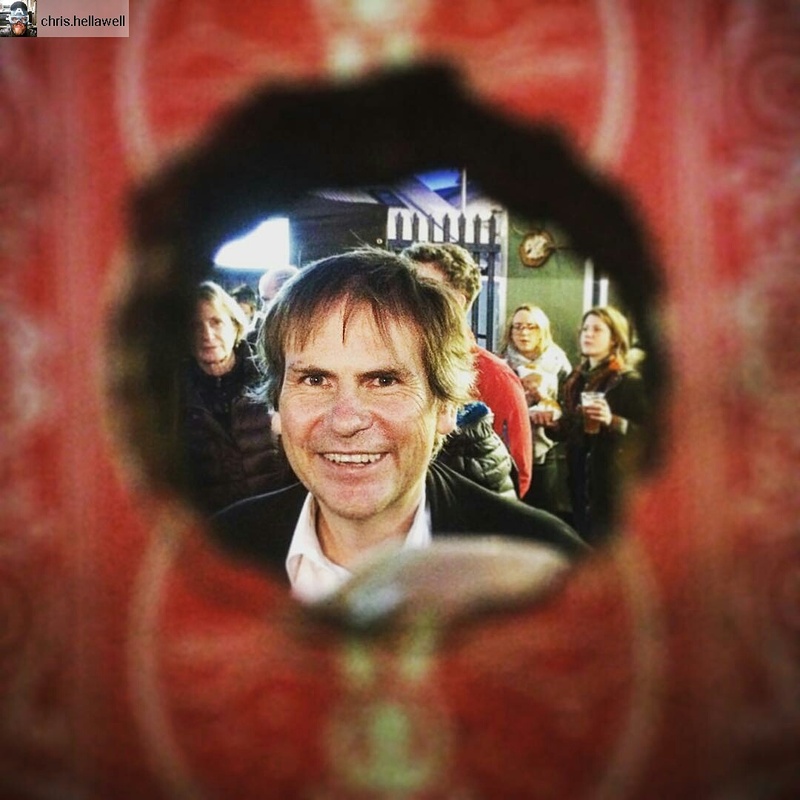 Instagram seems to be the new Social Media App that everyone is using – these day most people don’t ask if Jim the Magician is on Facebook or Twitter, but instead Instagram! So I’ve taken the plunge and have set up a Jim the Magician Instagram page. I have been watching lots of YouTube videos on learning how to use it. I am still quite confused! On Saturday, my friend Chris (from Edinburgh Tool Library) asked if I had any new magic to show him, “not new”, I replied “an old one, you haven’t seen”. Many of you will have seen how I burn a hole through a pack of cards with a coin to your chosen card, Chris hadn’t seen it. He was impressed and posted an amazing photo on Instagram (of course!) of me looking through the hole of the card (the main photo of this blog). For those wondering, The Pitt is on every Saturday (midday to 10pm) until Saturday 16th December, then we are taking a winter break. I perform magic from about 3pm till closing. Recently people have been asking me “have you learnt any new magic?“. Not recently – but I have heard you all and learning is underway – some new magic, and not just with cards! Have you heard of Bark.com? Most people will have received emails from them, encouraging them to join. That’s another new thing in my life. Despite being a bit wary and not knowing if I could trust Bark, I signed up. The way it works is people put in a search for a service they want (e.g. a magician) and their requirements (e.g. Birthday Party). I then pitch for the work and hopefully am successful and get a booking. There are up to 5 other people (e.g. magicians) also pitching. The service doesn’t take any commission for the booking, but it costs to send a pitch. As yet, I’ve had no bookings – but I have signed up for a package, where if I don’t get any bookings, they give my money back! Will let you know how it goes! So I dug out my old truck in the depths of my flat, sieved through my childhood magic, found some relevant tricks, also decided to make up some magic. Put it all in a suitcase, packed my bow-tie and we (Honey the Dog and I) headed off to Fife for a day out. The party was at Craigtoun Country Park, a big estate – unfortunately there was heavy rain for most of the day, so we were not able to explore. When the children were all out doing a Treasure Hunt (in the rain), I had time to set up my table, lay out my magic and get ready for their imminent return (See photo above). As they began to sit down and gather, I started to feel quite nervous, was I really up for entertaining 20 young children magic? Suddenly, at the last minute I decided to change my name to ‘Magic Jim’ (rather than ‘Jim the Magician’) and before I knew it Henry (my friend) was introducing me! 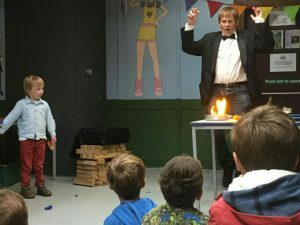 The magic went down a treat – and although, the first trick went wrong, there were lots of fun and laughter and even a few surprised and astounded parents who were watching from a far..!! But most important, the Birthday Boy loved it (see photo, right). 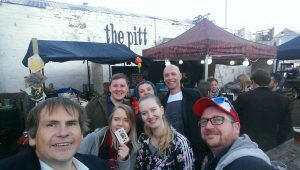 Although, I don’t think ‘Magic Jim’ (the Children’s Magician) will return to doing full-time magic at Children’s Parties any time soon, it was a great experience and lots of fun. 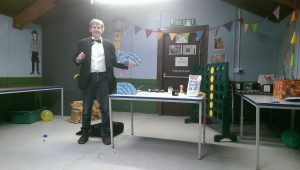 And with all this newness for Jim the Magician you never know what’s just round the corner…! !